In Ancient Greece, the god Asklepios (Asclepius) was a powerful god related to medicine who, according to the Greek mythology, had the power to bring people back from dead – a power that many ancient gods from multiple mythologies had. He was one of the sons of the god Apollo. We are all familiar with Asclepius in a way, since the symbol that is used for medicine, the snake entwined staff, was the rod of Asclepius – a tool that he used probably given to him by the gods. Asclepius was brought up by the mysterious figure of ancient Greek mythology, the centaur Chiron, who raised Asclepius and taught him about the art of medicine. Because Asclepius used his powers to bring people from Hades (meaning resurrecting them), the God of Hades complained to Zeus because Asclepius converted many people from humans to immortals. The result was for Zeus to kill Asclepius with thunder. 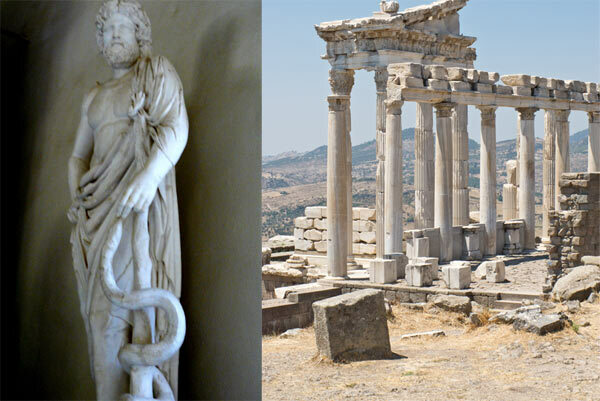 Asklepion (Asclepeion) were holy temples for worshiping Asclepius, but at the same time they were the first known hospitals in the history of western civilization. There were approximately 320 Asklepion (hospitals) in Ancient Greece. What is important is that for the healing of the patients a holistic method was used by Asclepius. Disease was considered a result of multiple social, environmental, psychological, spiritual, emotional and physical interactions. And for health to exist there is a need for balancing and harmonizing all those factors and as an additional measure medical intervention (surgery or medicine) would be applied. That was a perfect balance between science and spirituality. At the Asklepion, the patient would stay in a nice environment and enjoy theatre and music as well as having diet changes, hydrotherapy and psychotherapy. Once the therapists would decide that the patient was ready, then he would be sent to the temple for praying and sleeping inside the temple. The next morning, the patient would tell the doctor what dreams he had experienced – it was believed that dreams recounted a visit by the Asclepius, who held the key to curing all illness. The patient would then be given instructions for healing, according to the dream. It is interesting to see how in 1,000 BC the approach to healing was not only completely different, but also much more effective. And today, 3,000 years later, we gradually begin to reconsider going back to the methods that were used in ancient Greece. Many of the rituals that were used by ancient Greece in the Asklepion were later incorporated into the Christian religion (but Asclepius was replaced with Saints and Christian deities). During the last few years a few alternative healing centres have popped up all over the world, including those that use dreams as a method for assisting healing. Why did this valuable holistic approach in which the patient was treated with humanity and care disappear for so many years? And how did we give birth to powerful pharmaceutical companies and medicine that do not cure but only postpone disease? Whether Asclepius was a real God or not, or whether he could really cure the patients doesn’t matter. What matters is that medicine in ancient times was more natural, more holistic and more effective in searching for the root of the problem and treated the patient with care. Exactly spot on! Great post, thank you.